Three out of four U.S. physicians believe that electronic healthcare records (EHRs) increase practice costs -- outweighing any efficiency savings -- and seven out of 10 think they reduce productivity, according to a new survey. Deloitte's "2016 Survey of US Physicians" released this week found little had changed since its last report two years, when doctors surveyed at the time generally held negative opinions of EHRs. 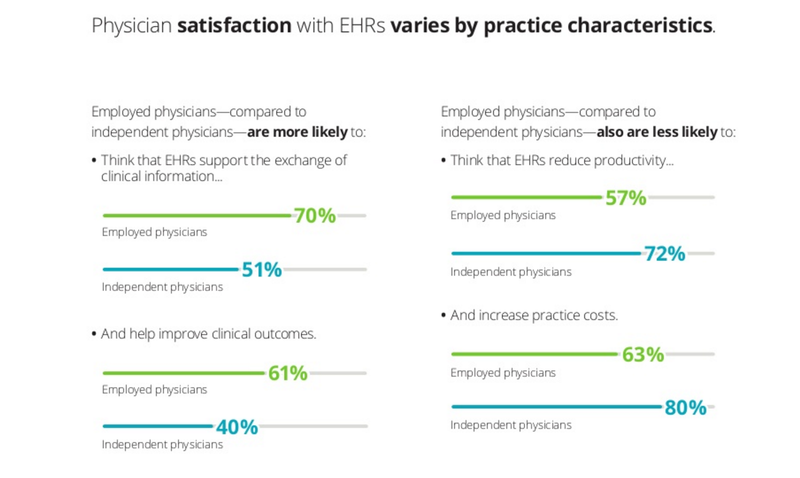 The latest survey found nearly all physicians would like to see improvements in EHRs, with 62% calling for them to be more interoperable and 57% looking for improved workflow and increased productivity. Deloitte has been surveying a "nationally representative" sample of physicians since 2011. The most recent survey was conducted in the spring and involved 600 respondents. Deloitte's survey is not the first to unearth negative attitudes toward EHRs. In July, the results of a study of 17 U.S. hospitals published in the British Medical Journal (BMJ), found EHRs had little long-term impact on patient treatment outcomes, and could even have negative ones in the short term. The Deloitte study, conducted by Harvard University and Brigham and Women's Hospital, noted that implementing a new EHR or switching to another is likely one of the most disruptive predictable events a hospital can experience, "affecting practically every employee and workflow. "In the period immediately after implementation, workflow disruptions created by technologies like electronic order entry can give rise to a wide array of unintended consequences, such as inefficient workarounds, disruptions in continuity of care, and other electronically enabled errors," the study said. "Quality could also suffer because providers might be distracted by the abrupt change in how they retrieve test results, consultation notes, and prior admission/discharge documentation, and how they document patient care." EHRs were mandated under the Health Information Technology for Economic and Clinical Health Act (HITECH) of 2009. The Act set up three phases for demonstrating meaningful use of interoperable EHR in healthcare systems and private physician practices. Healthcare providers that adopted EHRs were given bonuses; those who didn't were penalized on Medicaid and Medicare reimbursements. Under the "Meaningful Use" incentive program, the vast majority of hospitals and physician practices implemented EHRs. Last year, however, the Centers for Medicare & Medicaid Services (CMS) scrapped the Meaningful Use program and replaced it with a new proposed rule that rewards physicians based on patient outcomes. The Medicare Access and CHIP Reauthorization Act of 2015 (MACRA) outlined the new Merit-Based Incentive Payment System (MIPS). MIPS consolidates components of three existing programs: the Physician Quality Reporting System (PQRS); Physician Value-Based Payment Modifier (VM); and the Medicare EHR Incentive Program. The proposed rule also establishes incentives for participation in certain alternative payment models (APMs). "The Meaningful Use program as it has existed, will now be effectively over and replaced with something better," Dr. Mitch Morris, Global Life Sciences and Health Care Industry Leader at Deloitte Consulting wrote in a blog. "At its most basic level, MACRA brings pay for value into the mainstream [by] promoting the measurement of physicians in four categories -- quality, cost, the use of technology, and practice improvement." The final rule on incentives under the 2015 law was submitted earlier this month and is currently under review at the White House, Morris said. The final rule is expected to be finalized on Jan. 1. Deloitte's 2016 survey included U.S. primary care and specialty physicians and had new questions about MACRA. Under MACRA, interoperability between EHRs -- a key issue affecting productivity and patient outcomes -- is getting more attention. Steven Stack, president of the American Medical Association, has said that the lack of interoperable systems is one of the fundamental reasons the potential of EHRs has gone unfulfilled, Morris wrote. "For that reason, and likely others, Congress made interoperability a core focus of MACRA," Morris wrote. Cynthia Burghard, a research director at IDC Health Insights, said that for all the negative press EHRs have garnered, they have also done some good. EHRs, she noted, are transaction systems and data repositories, "not analytic or workflow systems." So while they may not improve productivity, "EHRs are key to documentation, alerts and setting off activities like orders," she wrote in an email reply to Computerworld. "Admittedly the data exists in the EHR to improve outcomes, but the users have to access the data and develop programs to improve outcomes -- including avoiding re-admissions," Burghard wrote. "For my money, healthcare organizations are just beginning to understand and use EHR data to improve health." While Deloitte's survey found physicians mostly had negative perceptions of their EHRs, that doesn't mean the Meaningful Use program was a failure. For example, 78% of the physicians surveyed believe that EHRs are more useful for analytics and reporting capabilities than for supporting value-based care or improving outcomes. "This has also increased since the 2014 survey. In fact, few physicians would stop using their current EHR system: Three out of five would keep the current EHR system they have and not replace it," Morris wrote. While EHRs cost physician practices tens of thousands of dollars to implement, and hospitals and other large healthcare facilities tens of millions of dollars, the technology has yielded a return on investment. 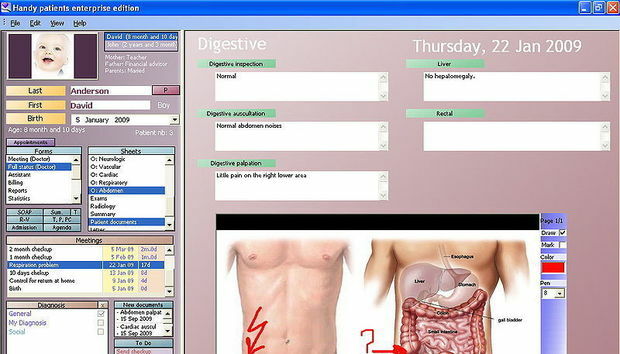 In a 2007 study, for example, Boston-based Brigham and Women's Hospital estimated it saved $5 million to $10 million per year after implementing a computerized physician order entry (CPOE) system because it reduced serious medication errors by 55%. Hospitals have also reported savings by eliminating paper medical record keeping and initiating electronic access to laboratory results and reports. "Healthcare's reliance on technology is not likely to change. In fact, MACRA's emphasis on utilizing and enhancing EHR systems and the charge to improve interoperability moving forward could strengthen the focus on technology," Morris wrote. "Those who are EHR 'enthusiasts' should consider the findings of our study and others like it that indicate we still have work to do before health IT can deliver a clear and discernable value similar to the value many enjoy with online retail shopping."